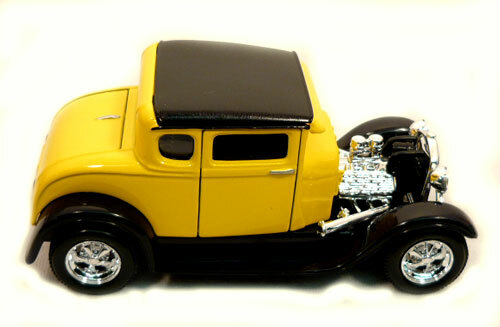 Cool Hot Rod in this new 1929 Ford Model A Coupe by Maisto Die Cast Collection. They come tow toned with roof and bottom in black and the body is red or yellow. The doors open from the front so you can see to bench seat and detailed black interior. The gas tank is in the trunk and also opens from the front. This free wheeling model has an open detailed chrome engine. Front wheels turn from left to right on these tricked out models. = Shipping weight is .75 lbs.